Pierce potatoes several times with fork; place on microwavable paper towel in microwave oven. Microwave on High 11 to 14 minutes or until tender, turning potatoes over and rearranging halfway through cooking. Let stand 3 minutes. Meanwhile, in 10-inch skillet, cook ground beef over medium-high heat, stirring frequently, until thoroughly cooked; drain. Stir in chipotle chiles, tomato sauce, green chiles, water and 1 cup of the cheese. Cook uncovered 2 to 3 minutes, stirring occasionally, until thoroughly heated. Cut potatoes in half lengthwise; place on plates. Mash potatoes slightly with fork. 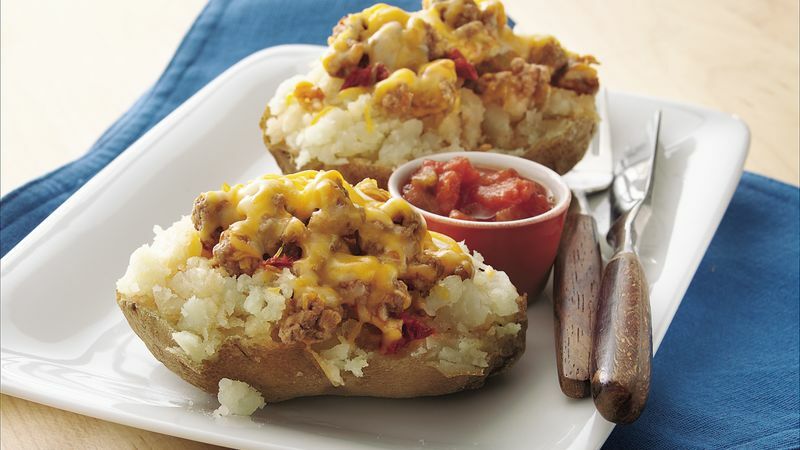 Spoon beef mixture over potatoes; sprinkle with remaining 1/2 cup cheese. Serve these hearty potatoes with salsa and sour cream, if desired. Then, add a tossed green salad with your favorite dressing to complete the menu.